There are times that it is a bit difficult to believe everything Jeff Sawtell says. 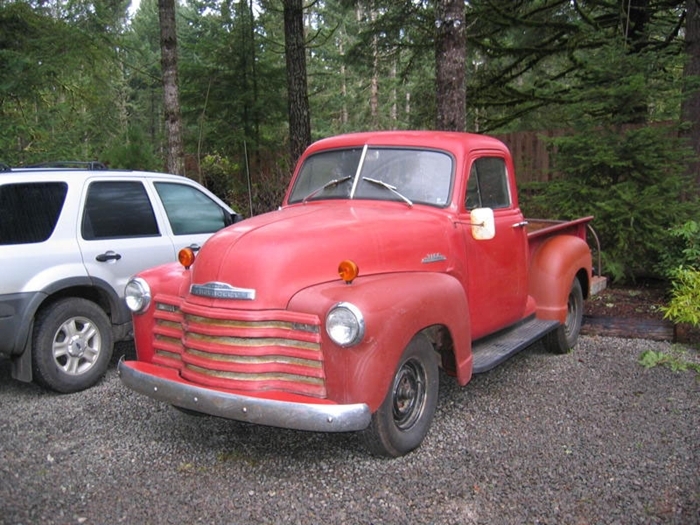 For example, he claims his 1953 Chevrolet step-side pickup is his first vehicle restoration project. He’d like to have you believe the first time he ever sprayed automotive paint was when he applied the color and clear coat on the truck. 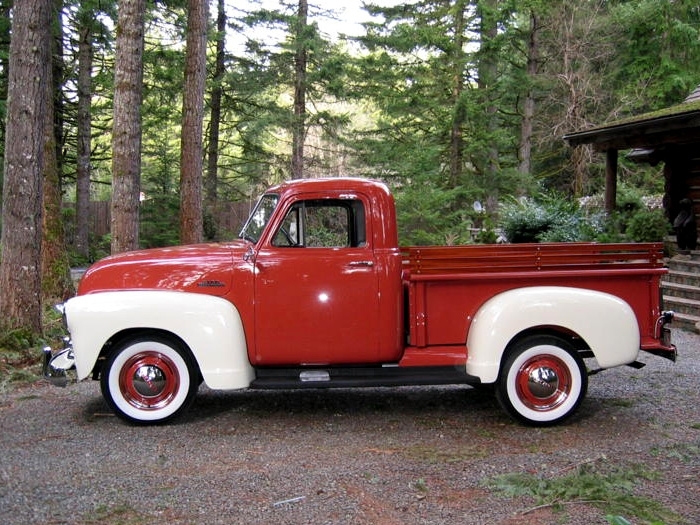 And while he doesn’t claim the gleaming pickup is a daily driver, he contends he and his wife, Renee Kemnitz, have put thousands of miles on it, going to shows and cruise in and just enjoying it on the roads that surround their rural home. Looking at the near flawless truck, it’s hard to believe. But it’s true. 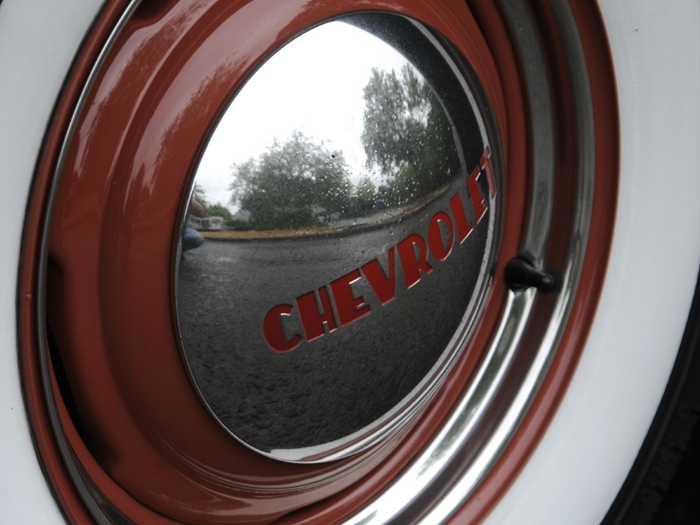 The Chevy was a mess when he and his wife first spotted it in a shed in Helvetia, a rural farming community in the shadow of Oregon’s Cascade Mountains. 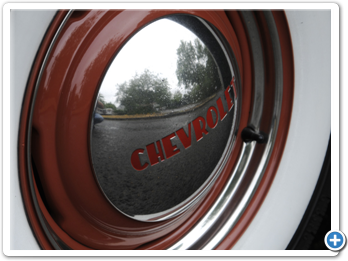 Sawtell wasn’t looking for a truck when his wife spotted the Chevy. 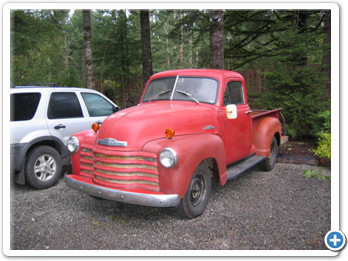 He was actually in the old logging town to buy stock for his custom woodworking business. He builds things like furniture, custom cabinets and curved staircases. “My wife’s the one who fell in love with it,” he says. 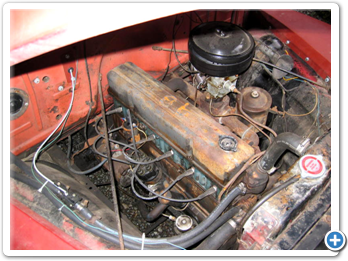 Jeff says not much is known about the truck’s history, other than, based on its condition, it apparently lived a very truck-like existence. Sawtell says he figured he could use the truck to run business errands. 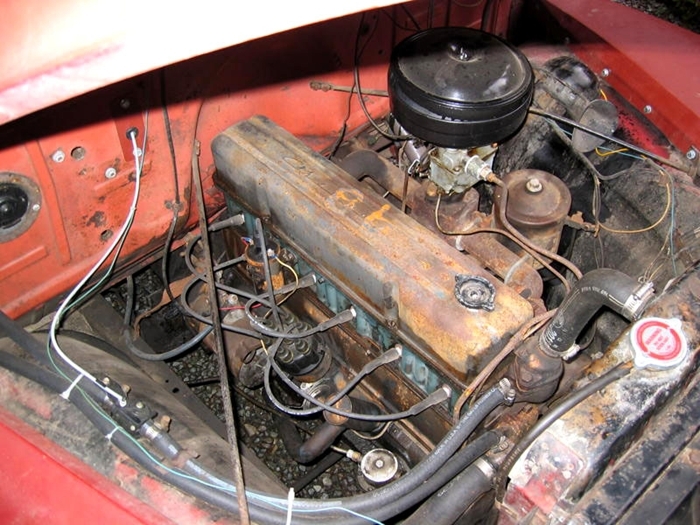 “I wasn’t planning to restore it,” he says. 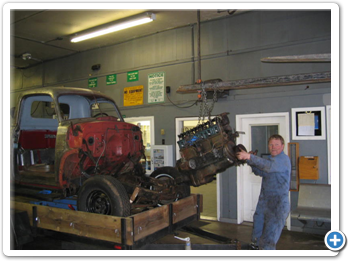 But once he got it into the shop to take care of a few minor issues, he just never quit. Renee wasn’t at all surprised. Actually, she would have been amazed if it hadn’t ended up a major project. Everything got stripped, smoothed, sanded and painted. And Sawtell admits not everything went right the first time around. He also discovered the truck apparently had been in an accident that compromised the driver side door pillar. 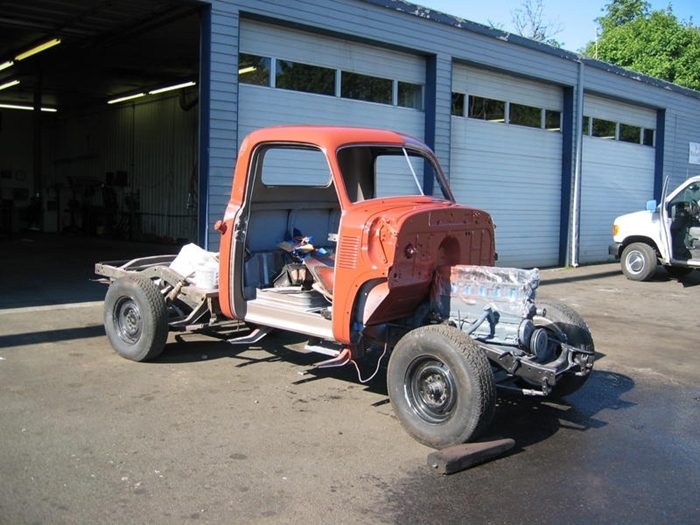 And he says he spent days and days trying to get the front fenders and hood to line up perfectly. He says the best part of the project was the research. 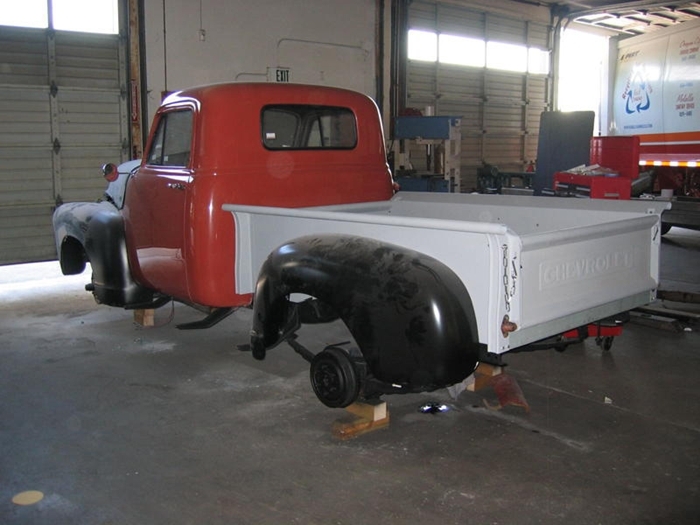 One of the things he “discovered” during his research was the original color of the truck. 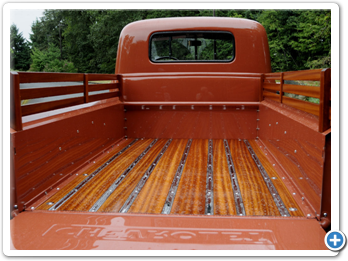 “While I was working on the tail gate, I sanded down into the copper color that I figured was a primer,” he says. 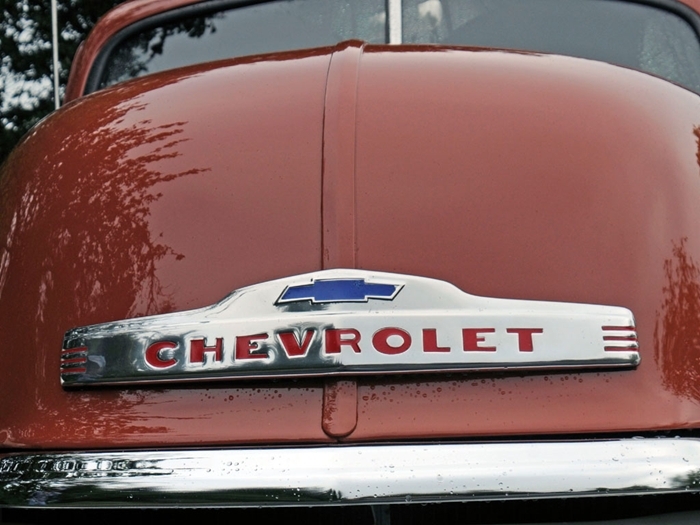 “Back in the ‘50s, Chevrolet apparently didn’t include a color number plate on all its vehicles, but a friend who owns a Chevy parts business said that as the trucks went down the assembly line, often someone would write on the firewall what color it was supposed to be painted. 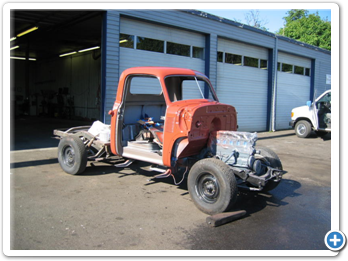 “I began wet sanding the firewall and there it was: “coppertone”. Unfortunately, there’s no formula for it. 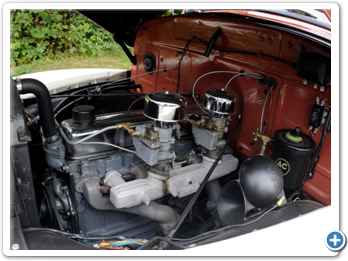 But Sawtell found a piece of cowling that hadn’t been repainted red, and a local shop was able to scan the color and come up with a match. But then there was a problem with the fenders. 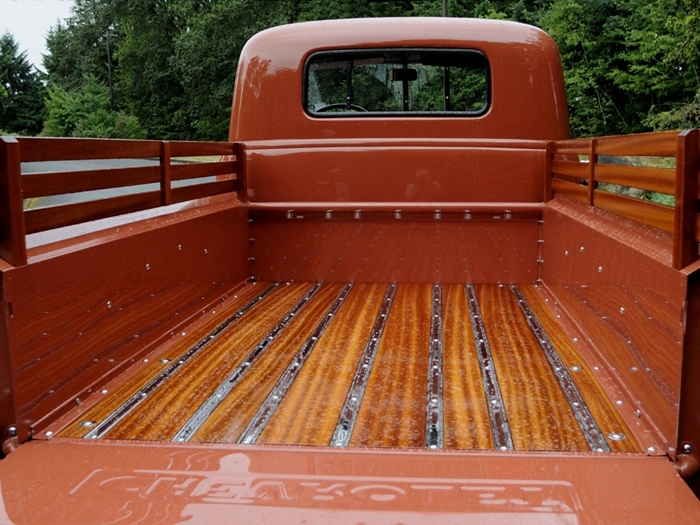 Sawtell knows that GM didn’t offer a two-tone paint job on its trucks ’til the following year, but he figured it is his truck so he’s doing things the way he wanted to. There also was a time when he would walk through shopping center parking lots carrying a piece of coppertone-painted formica. 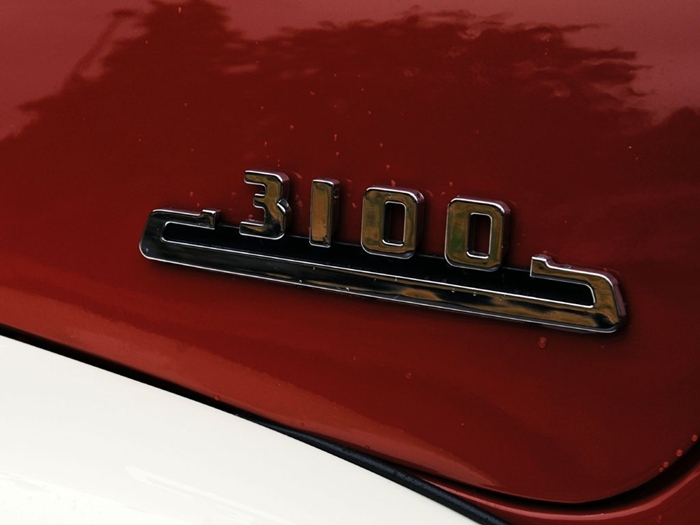 The winning color came from a 2003 Dodge. The end product ended up being a combination of original and updated parts. 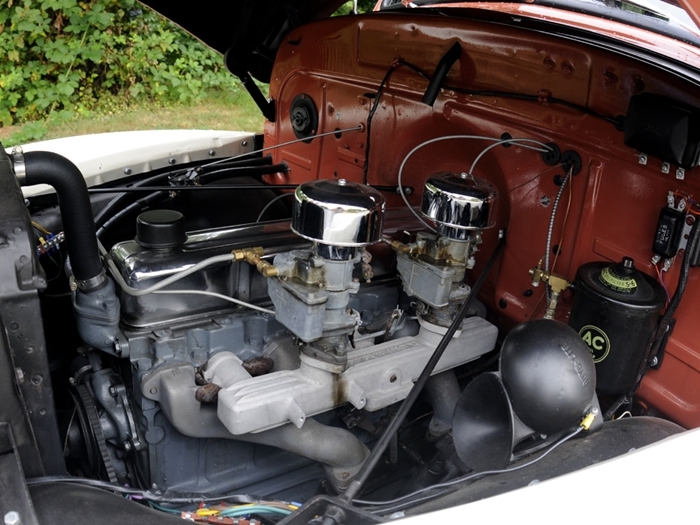 For example, the old 216 cubic inch splash-lubricated engine had long since been yarded out, to be replaced with a more reliable pressure-lubed 235 six-cylinder. 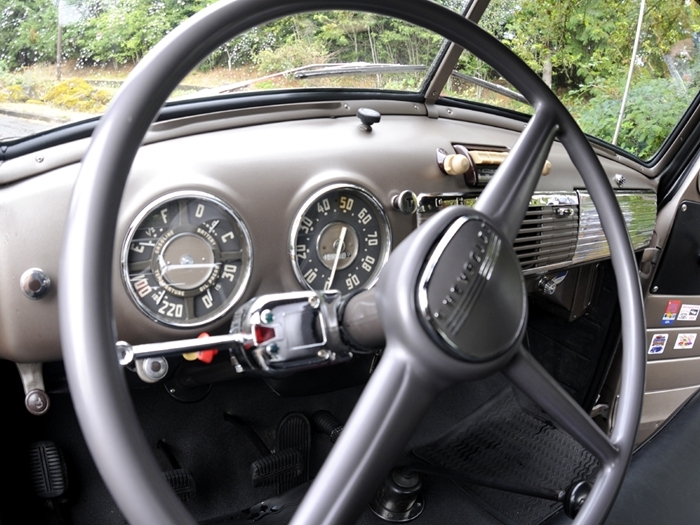 But unlike many restorers who use modern radio/CD players, Sawtell insisted on having the old tube-type radio rebuilt. “You turn it on and it still has to warm up and it makes all sorts of sounds until it gets ready to work,” he says. And the wood decking on the bed is far from original. Sawtell picked a vertical grain mahogany for both the bed and bed rails. He cut and finished both wood features with seven coats of marine varnish. “Some people look at the wood and say it should be finished so the grain doesn’t show,” he says. “But the grain is part of the beauty of the wood. Just like his wife predicted. 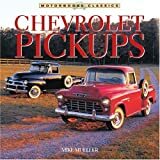 A superb color history on Chevrolet’s pickup trucks from 1918-1994, including El Caminos, Suburbans, Blazers, Compacts, and GMC trucks. 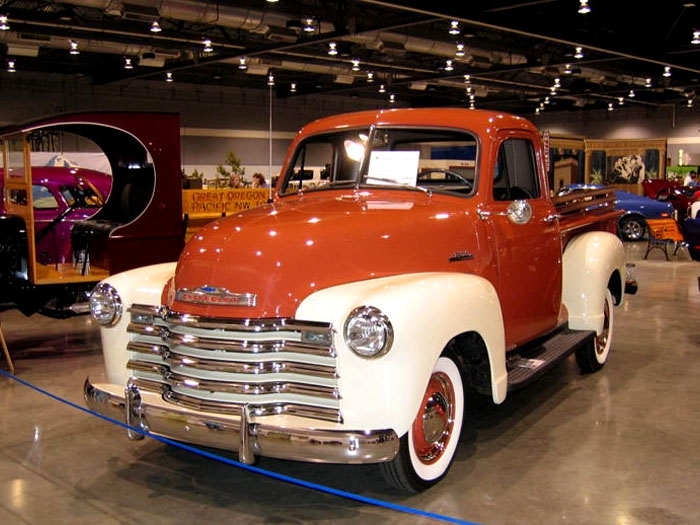 Traces the trends in truck styling and focuses on the particularly significant eras in pickup history, including the Art Deco series (1941-46), the Advance Design models (1947-55), the Task Force series (1955-59), and the Integrated Styling series of 1969-72. 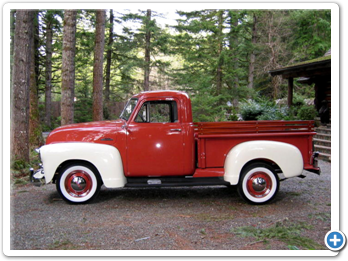 Color photos show beautifully restored and original trucks. 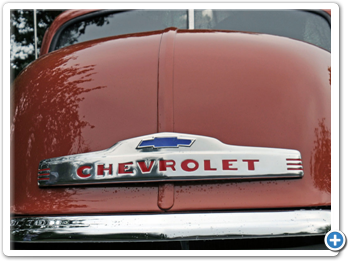 This video explores the trucks produced by Chevrolet in the 1950s through a series of seven films. 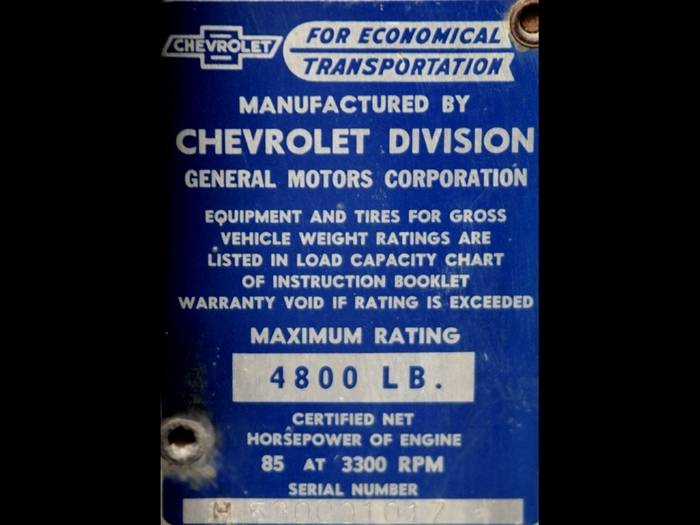 Here are the contents of this DVD: It’s Your Money - A showcase of Chevrolet delivery trucks and their features. 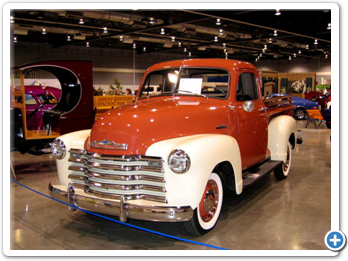 The Men Who Know - A presentation of the men who use big Chevrolet trucks and their trucks. 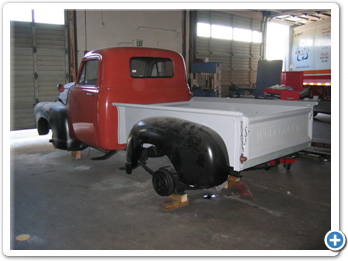 Transportation Unlimited - Explores the many uses of transportation by truck in industry and construction. The Most Important Connection - A discussion of the importance of good brakes on trucks. It’s Been There Before - A look at how reliability is built in by rigorous testing of features in a variety of conditions. 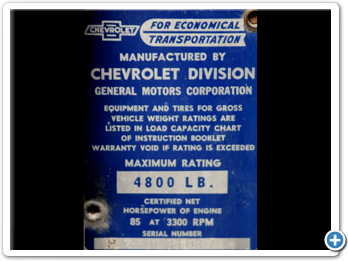 Heading Up The Heavy Duties - An exploration of a variety of Chevy heavy duty trucks. 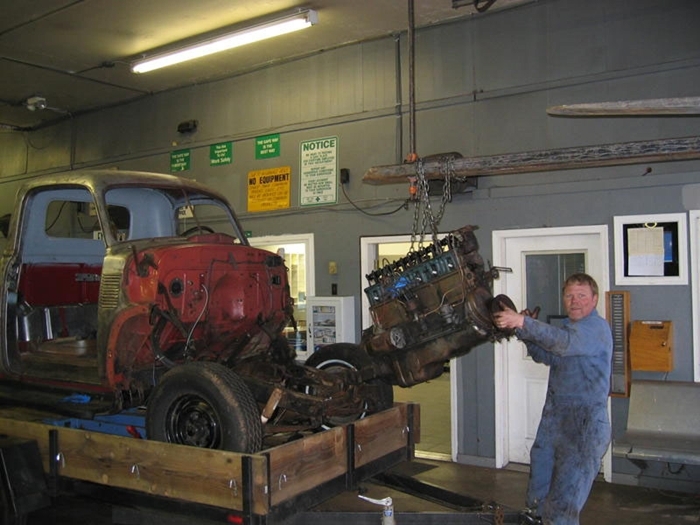 Meeting The Challenge - A demonstration of a 1956 Chevy 4x4 truck offroad climbing Pike’s Peak. Quality Note: The quality of these old films varies from excellent to fair. You will notice things like faded video and mixed audio quality in some of the clips. This DVD has a runtime of approximately 1 hour 8 minutes. 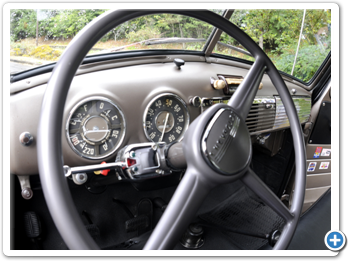 This is a factory-authorized reproduction and covers all car & truck models. 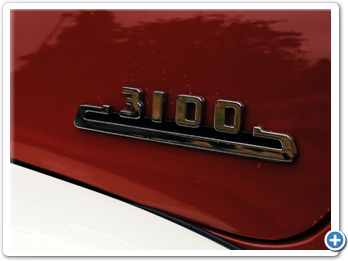 Approximately 115 pages and includes step-by-step installation procedures.